Looking like an up-cycled haven, you can instantly get an idea of the Anderson's ethos as you look around. 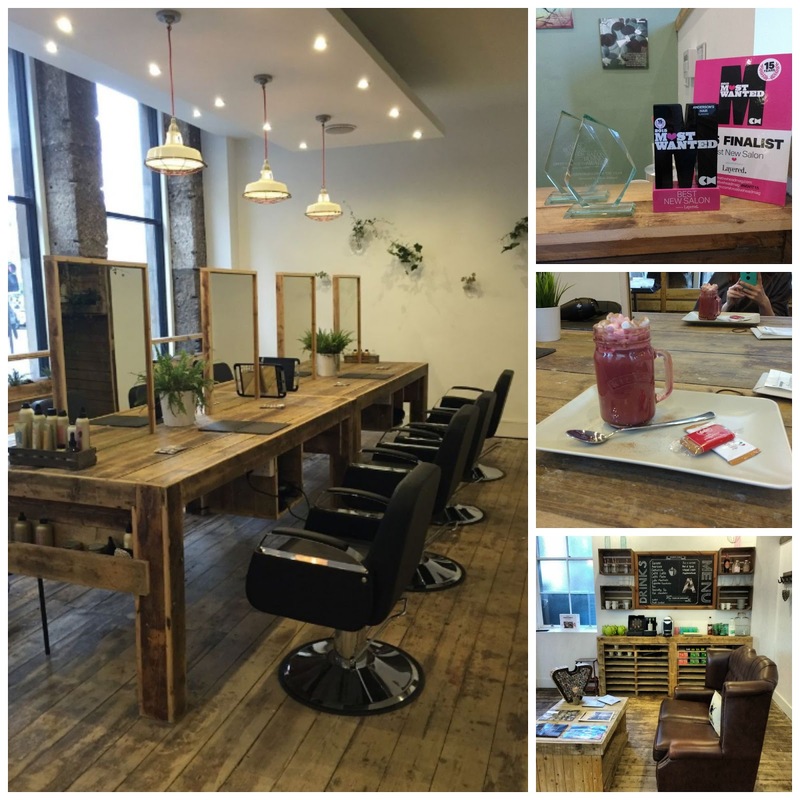 From crates on the wall to act as planters, to old church floorboards acting as the actual cutting stations- this place has some serious eco style and it is no wonder they have already bagged a Salon Design of the year award! There is not an air of pretentiousness about the place or that really clinical vibe I often I feel when I walk in salon that instantly makes me feel completely un-relaxed. With a stunning leather couch to chill out on while you wait, sitting right next to the most glam refreshment station I have ever actually seen in a hairdressers ( and most cafes for that matter!) this place is ridiculously cool without being intimidating. Situated handily just off of George Square on South Frederick Street, Anderson's has only been open for under a year but already racked up some seriously impressive accolades, the most recent of these being the prestigious Best New Salon at the Creative Heads Most Wanted awards in September. I was lucky enough to get to bend the ear of owner Keith who is the most down to earth, passionate and seriously talented guy whose creativity and style shines through in the salon. 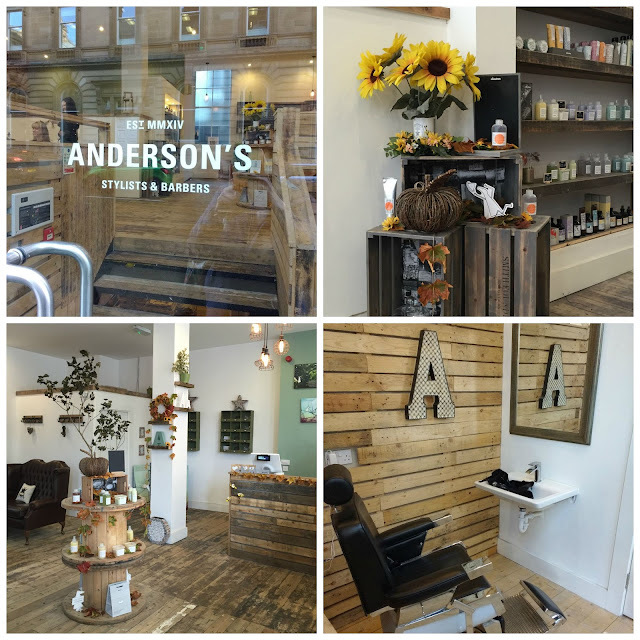 With a fascinating history of his own (from footballer to club nights to hair dressing) he has an amazing vision for Anderson's and alongside his partner Caroline, they have put together something incredibly impressive and most importantly, unique to the Glasgow salon scene. In the future there will be a second floor offering more cutting stations, a bespoke barbering area, a bar and an event space that will allow the team to offer even more and I am super excited to see what they come up with. So aside from the fact I want to move in ( and possibly want Keith and Caroline to adopt me) was the actual cut any good?? Yes, yes it was. Keith took time to listen to what it was I was looking for, what kind of time I put into my hair, and generally the lifestyle I needed a cut to fit into. He was fantastic at talking me through his vision of how to bring it all to life to suit my face shape and using semi permanent colour to bring warmth into my skin tone and really make the cut pop. 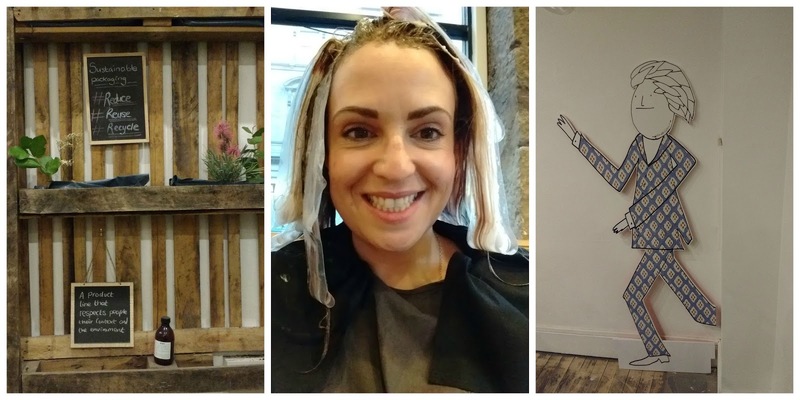 Over his years in the industry, Keith has really been taken by the work of Davines, finding their high-end products and techniques to be ahead of the game in the industry, so he set out to be the first salon in Scotland to be representing the brand. Davines products are guided by the principle of sustainable beauty and it ties in so beautifully with the Anderson's ethos along with their shared passion for creativity and quality. Keith talked me through a Davines technique he would be using to allow for really natural application of the lighter colour to be worked into an over all warmer dark shade on my hair which would really give it good movement and depth. Using what I can only describe as strips of sticky fly-paper alike pieces, the Flamboyage technique means he could attach my hair to them and get a light handed and not too ‘organised’ distribution of colour through my lower lengths of hair. It handily also makes the colouring process is incredibly quick and pain free without having to use all the foil in the world and really hand pick every colour strand which was perfect for the undone look I prefer. With the dye on, I sat back and enjoyed a magazine and some seriously impressive refreshments. I know I shouldn’t award points to somewhere because they can bring me the greatest hot beverage of all time, but it is my blog and I am going to. One minute you ask for a hot chocolate and the next thing you know there is the most amazing marshmallow filled creation sitting in front of you in a mason jar complete with biscuits and a dusting of extra chocolate- I mean come on. If I don’t normally relax in a salon, here I was endanger of getting a little toooo comfortable! It was this level of attention to detail that just makes the experience feel so special. From guzzling delicious drinks, to being able to put my feet up on the reclining hair washing station to the complimentary head AND hand massages the lovely team provide- you just could not fail to walk out feeling on top of the world. With the colour off, and feeling insanely good about myself already, Keith got under way with the cut as I interrogated him all about the plans in the works for the new basement addition to the salon. This place already has a pretty magical feel in it that goes far past ‘just a hair cut’ that I can totally imagine how amazing a space they are creating. Before I knew it, we were done- and it sounds ridiculous but I was having such a good time in the chair that I actually completely didn’t notice my hair actually changing! But what a change it was, I was completely bowled over with my new look- it might sound silly but it just felt so me. It was effortless to recreate, the colour just made me look much more polished with still retaining that undone feel and the cut was just perfect for my face shape and gave me the volume I always crave. 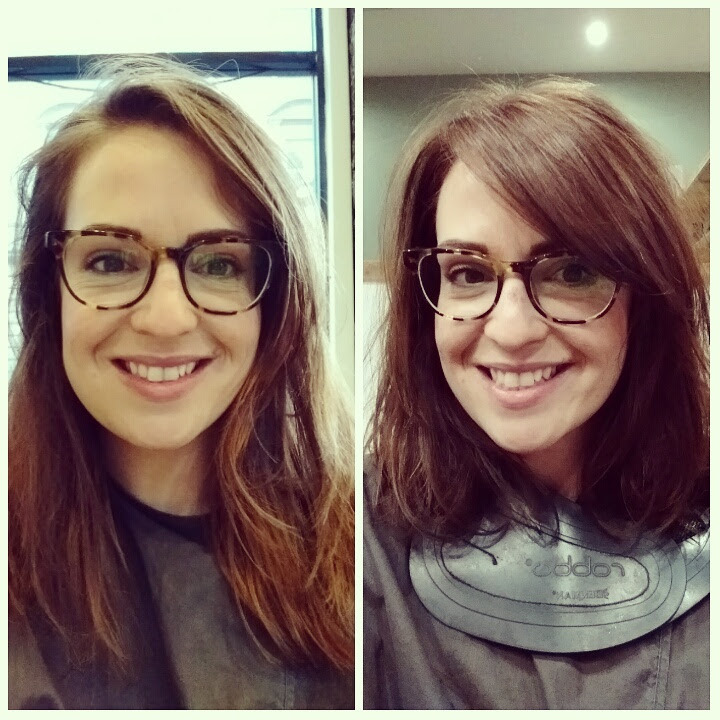 I was over the moon and really could not believe just how good the finished effect was- I never thought I would leave a hair salon feeling so happy!! I was pretty sad my time for now had come to an end but without a doubt I will be back to see what the team have come up in the future, with such a wonderful hand picked team of stylists to choose from and such an exciting direction from their passionate lead, Anderson's is sure to be winning more awards soon. You can check out the salons website to book online or call the team on 0141 237 6250. I have a couple of 20% off first time visit vouchers for anyone booking ( just get in touch on Twitter) and it is worth pointing out students can get 25% off prices every Tuesday and Wednesday too. What a lovely cut, really really suits you :) sounds like a perfect place to go. 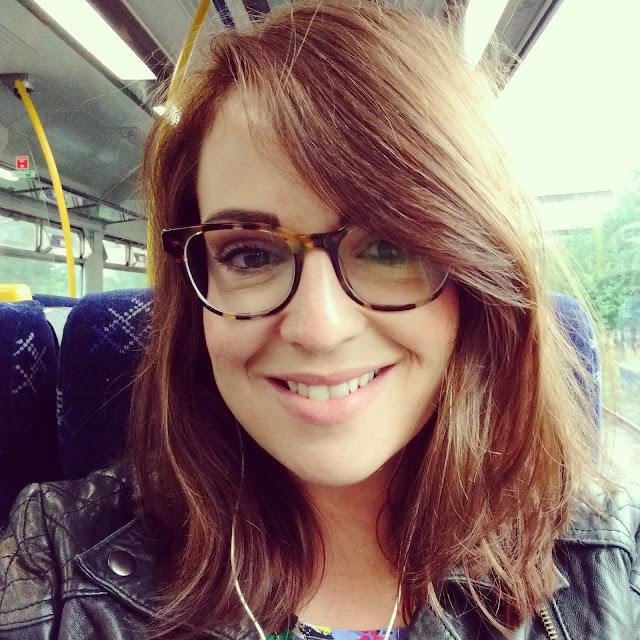 I love going to the hairdressers and always end up with either a total chop or a completely different hair colour! Just had my hair chopped off really short last week but i'm thinking of colouring it now, might have to take a visit up! I love it, its so nice and autumn-y I love the caramel coloured highlights.